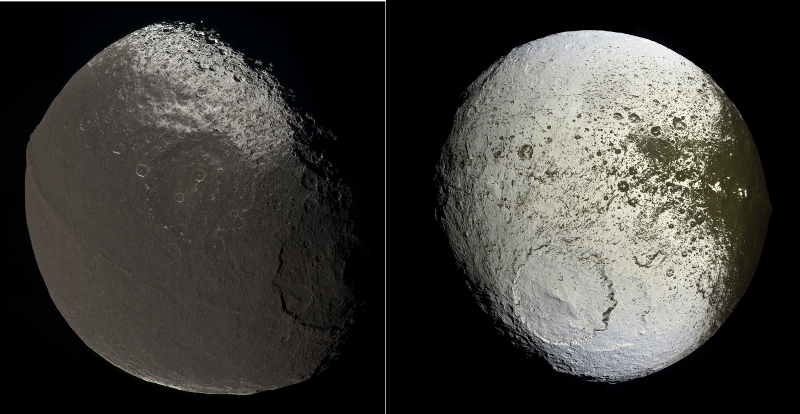 The two sides of Iapetus: the leading edge (left), which is darker in color and exhibits an odd equatorial ridge, while the trailing edge is an icy white color. The moon is also distinctly non-spherical. Both images are from the Cassini space probe. Saturn’s moons are wonderful in their strangeness and variety. I’ve already written about my favorite moon, Hyperion (with its oddly spongy consistency and chaotic rotation), as well as Titan (with its thick atmosphere and methane seas) and of course Enceladus. Today’s moon is also weird and marvelous, with a number of mysterious aspects: Iapetus, Saturn’s third-largest satellite. From the start, Iapetus seems weird: one side is a lot more reflective than the other, a fact first noted by its discoverer, the astronomer Giovanni Cassini, who first observed it in 1671. As we’ve seen with most of the other moons in the series, Iapetus is tidally-locked to Saturn, presenting the same face to its host planet. The side facing the direction the moon orbits—called the leading edge—is a dark reddish color, as are the polar regions, while the trailing edge (the side facing opposite to the direction of orbit) is nearly white, and very reflective. The entire moon has a yin-yang pattern when viewed from above the north pole, and in general looks a lot like a baseball, if the two pieces of leather stitched together were of different colors. 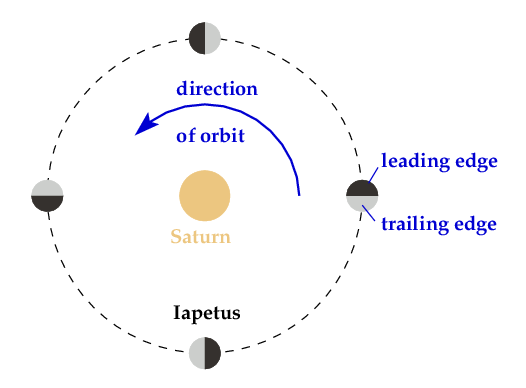 The orbit of Iapetus, showing the distinction between the leading edge and trailing edge. Sizes are not to scale! Iapetus, like Enceladus and Hyperion, is largely icy in composition. The color difference seems to be from the collection of debris as Iapetus orbits: little chunks of rock lodge in the surface of the moon, which when exposed to sunlight heats up faster than ice. The heated rock then sublimates the ice (changing it directly from solid to vapor), leaving just the gray-brown residue we see on the leading edge. The trailing edge, which is spared from bombardment of this kind, remains mostly icy. The fact that the ridge lies precisely along the equator is obviously no coincidence, but why it should be so is a mystery. One possible solution involves the tidal destruction of a smaller body by Iapetus. As described by Emily Lakdawalla (based on a paper to be published in the Journal of Geophysical Research), perhaps a small moonlet fell into orbit around Iapetus after it formed, or was made from an impact that broke pieces of the moon off. If the moonlet was close enough to Iapetus, the gravitational force on its near side would be substantially stronger than the force on its far side, exceeding the internal forces holding it together. The moonlet then would break apart, making a ring around Iapetus, which over time would collect precisely along the equator. 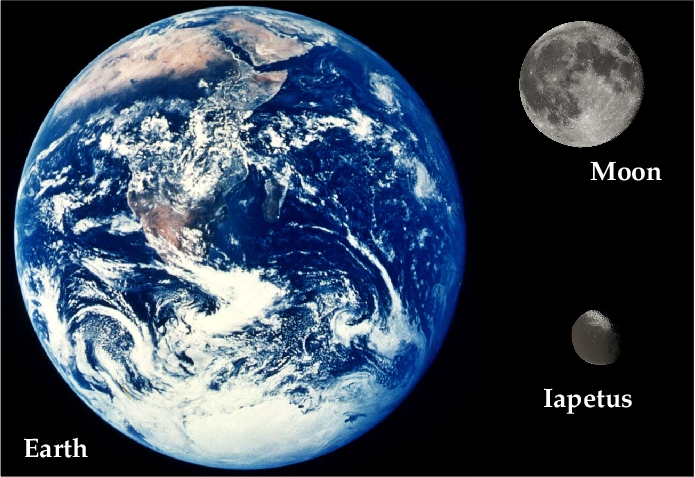 Iapetus compared to Earth and the Moon. It's not spherical, but the diameter at its equator is slightly less than half that of the Moon. However, since it is composed largely of ice, its mass is a lot less than a rocky body of the same size would be. Whether this particular scheme is correct or not, Iapetus is an interesting moon. Comparing moons, planets, and other objects across our Solar System helps us understand the entire history of our local environment. Why objects appear the way they do reflects their evolution, the forces that forged them over time. Iapetus’ weirdness is no different: its odd features are the product of its long history, just like Earth’s continents, Mars’ channels, and Jupiter’s storms.